It’s that time of the year again. Oktoberfest has come to Ober Gatlinburg with the promise of cooler weather, snow on the horizon, amazing German food, and of course beers galore! As winter beckons and the fall leaves begin to turn to brilliant shades of red and gold, visitors are flocking to the Smoky Mountains and enjoying the ski area’s 7th Annual Oktoberfest. This annual event can be enjoyed from September 23 through October 30, 2016. Families and friends can delight in the special German food that is prepared on a daily basis. The cuisine is inspired from traditional Bavarian festivals and includes a few crowd-pleasing classics such as turkey legs, strudel, schnitzel, bratwurst, pretzels, and of course heaping side orders of sauerkraut. Attendees over the age of 21 can choose from a wide selection of exotic beers that make the perfect accompaniment to the German cuisine. Want to travel to a German bar without booking a plane ticket? Festival-goers 21+ can head to the Outdoor Bier Garten to enjoy a beer sampling. Each weekend a new brewery is featured and classic German beers are poured. In addition to sampling beers from local breweries, attendees can also partake in family-friendly outdoor games. Ober Gatlinburg’s Oktoberfest is about more than drinking great beer and enjoying fine German cuisine. It is an opportunity for family and friends of all ages to gather together to celebrate friendship and the changing of the seasons. The Bavarian Fun Makers Oompah Band once more performs traditional Bavarian folk dances, as well as oompah music, yodels, and sing-a-longs. From noon until 6:00 pm daily and 7:00pm Saturdays, the Bier Garten is open for the grown ups, and the outdoor games for the kids include two inflatables, and Free Face Painting on Saturdays and Sundays! 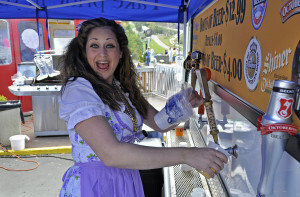 If you are looking for an excuse to take in a fantastic view of the Smoky Mountains, or if you simply are enticed by the opportunity to enjoy this German cultural festival, then Oktoberfest is the event for you! Whether you only go to the festival, or you take a detour to enjoy riding on the nation’s largest Aerial Tramway, Ober Gatlinburg is the perfect day trip on your weekend getaway. 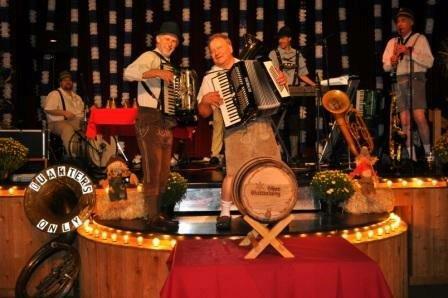 For more information see the Oktoberfest website and discover a whole new meaning for fall fun when you attend Oktoberfest at Ober Gatlinburg this year!